As an elementary teacher, especially the past few years being an elementary math coach, I have become accustomed to using tools such as base ten blocks, rekenreks, counters, beads and other things of that nature to help students make sense of numbers and operations. I’ve seen firsthand the tremendous growth students show in understanding when they use the tools to help identify patterns, create written representation and make conjectures about the mathematics. 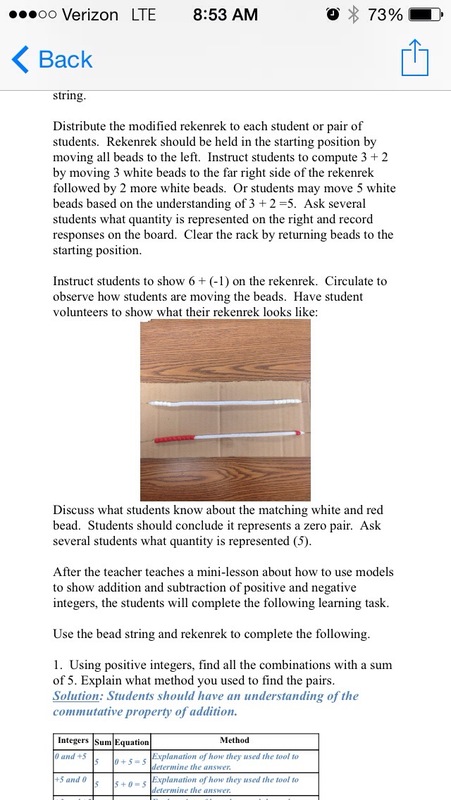 As I’ve been going through the GA Frameworks for 7th grade to help me make sense of the 7th grade standards, I noticed the occasions of using manipulatives are not as frequent as they are in elementary. So I thought what better way to hit multiple birds with a really huge stones. Why not marry the two, elementary manipulatives with middle school concepts. Let’s take for example, the addition and subtraction of integers. What’s the go to manipulative with that? Two colored counters! There are common misconceptions that come along with using the counters only. 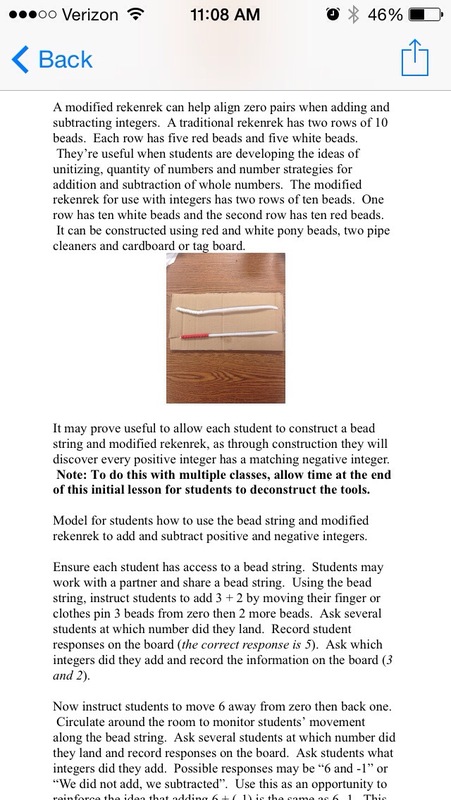 Not fully understanding zero pairs or when subtracting removing the counters instead of bringing in zero pairs are ways this tool hinder student understanding. Why not instead use a modified rekenrek as explained in my insertion into this frameworks task. 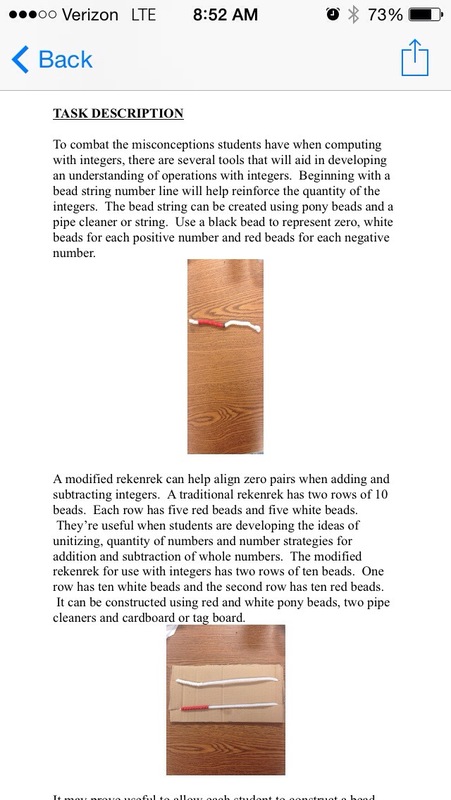 To connect quantity of integers, movement on a number line and patterns of adding and subtracting integers, why not use a bead string. I even found a way to sneak in a number talk into a unit on operations with rational numbers. I saw it as a great opportunity to remove the warm up problems prominent in upper grades and insert a chance to have discussions about strategies as we do quite often in elementary. I’m feeling more comfortable with this content, more at home with my conceptual way of thinking. I haven’t used a textbook since I taught 5th grade, that was over 5 years ago. I’ve become accustomed to engaging students in tasks in which they can develop an understanding of the concept, have discussions about the mathematics and have their misconceptions brought to the surface. I was never able to create those moments when I used a textbook for my math instruction. Next school year, I’m leaving my comfortable world of frameworks, Exemplars, Van de Walle and resources of that nature. I’ll be entering back into the textbook world, in a new arena, middle school. One could be tempted to just fall in line with the status quo. Only that would go against everything I’ve come to believe in as far as math instruction. My decision, make a flexbook textbook to use for my math instruction in 7th grade. With the flexbook, I can pull together various resources which will allow for students to develop the understanding of the concepts, have meaningful math discussions and allow their misconceptions to come to the surface. I’ve begun pulling tasks from Georgia Department of Education’s math frameworks for 7th grade, as well as problems from Exemplar’s program. I want to pull in as much as I can in order to have enough materials for differentiation and dare I say, homework (which is a whole other monster in my head). If you’re reading this and have any suggestions for resources I can pull into my flexbook, please share in the comments of this post or contact me @MrsJeniseSexton. My flexbook textbook is not yet published so it cannot be viewed at http://www.ck12.org. It’s currently titled Conceptual Mathematics- 7th Grade by Jenise Sexton. If you haven’t heard of number talks by now, it may be safe to say you have been a bit disconnected from the math world. 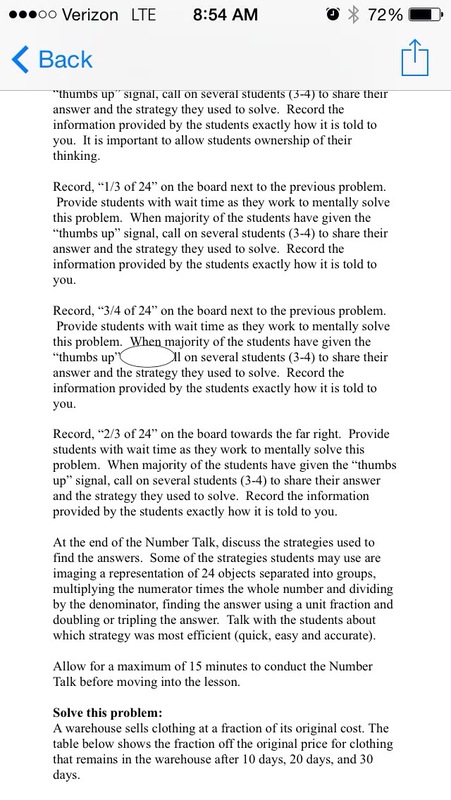 Five to fifteen minutes is all it takes to encourage math discussions among students, get an idea of the strategies your students possess, capture student thinking for everyone to see and/or reinforce ideas which may not fit into your current unit of study. At the elementary level, I’ve seen the tremendous effect number talks can have on students’ thinking, math language and strategy use. Just listen to these second graders discuss how they would make 24 from the given numbers 2nd graders making 24. This language and thinking was developed during daily number talks. Because I am an elementary teacher at heart I never thought about number talks in middle school. From this document came my aspirations for number talks. Here’s what I envision; review many 6th grade concepts through number talks. This Summer I’ll review the 6th grade units as aligned by the GaDOE. Using each units concepts and standards, I’ll create number strings in which I will use on the days I don’t use Estimation 180. To capture student thinking, my goal is to snap a picture of the recordings and upload them into an Evernote notebook dedicated to Number talks. This will allow for the information to be accessed from wherever Internet is available.